STILLWATER, Okla. (AP) — Oklahoma State’s 48-42 loss to Iowa State marked the second time in three games that the Cowboys surrendered more than 40 points in a home defeat. While Oklahoma State (4-2, 1-2 Big 12 Conference) has demonstrated an impressive pass rush that leads the nation in sacks with 28 and ranks third in tackles for loss with 55, it appears the weak spot of their defense lies with the young secondary group that is surrendering an alarming number of passing plays. The Cowboys have started two true freshmen, Kolby Peel and Jarrick Bernard, at safety in the last two games, with sophomores Malcolm Rodriguez and Thabo Mwaniki, who each started the first four contests, also seeing plenty of action in the rotation. Mwaniki is the only one of the four who had seen the field on defense before this season, starting two games last year, and the group is experiencing growing pains. Oklahoma State has allowed 1,349 yards passing over the last four games. That’s an average of 337.3 per game, which would rank 128th out of 130 FBS schools if that was their full-season average. As it is, their overall mark of 241.3 ranks 91st. Iowa State freshman quarterback Brock Purdy, in his first significant college appearance, thrived against the then-No. 25 Cowboys, completing 18 of 23 passes for 318 yards and four touchdowns. Two weeks earlier, another true freshman QB, Alan Bowman of Texas Tech, sliced up the Oklahoma State defense for 397 yards and two touchdowns on 35 of 46 passes in a 41-17 victory. 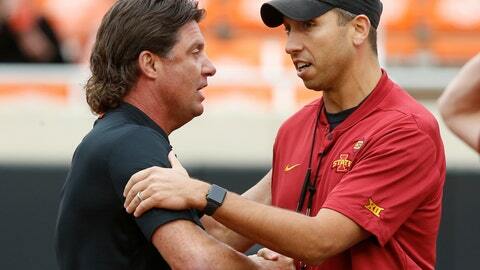 Gundy believes his young defenders are falling victim to eye fakes, and it is costing them. Gundy said the issue is a byproduct of the type of offenses that most Big 12 schools utilize, which makes it difficult to discern what type of play is coming. Effectively combating that requires concentration by the defenders to figure it out before it happens. Oklahoma State’s next test will come Saturday on the road at Kansas State (2-4, 0-3), which is coming off a 37-34 loss at Baylor. Gundy believes his team’s positive attitude will help it bounce back.